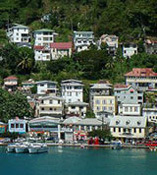 Nonresidents are taxed on their income from sources in Grenada. Income tax is generally levied at progressive rates. Rental income earned by nonresidents is subject to 15% withholding tax, withheld by the tenant. There is no tax on capital gains in Grenada. Sales of real property are liable to property transfer tax, which is levied on the sales price or the property value at the time of the sale. A citizen selling a property pays 5% transfer tax. A non-citizen selling a property pays 15% transfer tax. A non-citizen buying a property pays 10% transfer tax. Property tax is levied on all real property n Grenada, payable by the owner or by the tenant, according to the lease agreement. The tax is levied on the market value of the property and a taxable rate is applied based on the classification of the property. For residential properties, the tax is levied at 0.20% on land value and 0.30% on the structure/ building value. Income earned by foreign is taxed at the corporate tax rate of 30%. Income-generating expenses are deductible when calculating taxable income.